Erin Franco remembers a time early in her marriage when she had difficulty looking at her husband. As a young couple she and her husband, Michael, believed their love for each other would allow them to withstand any of life’s difficulties but babies, changing jobs, financial hardship and other stressors tested that love. “I remember there were weeks (when they were experiencing financial setbacks) that I was so angry and confused that I could barely look at my husband, let alone have a safe, honest conversation about how we are doing as a couple,” she said. The saving grace for their marriage is not “something that reinvents the wheel” they said, but a movement for sacramentally married Catholic couples that began in Poland 40 years ago with support from St. John Paul II. The movement, Domestic Church, gives couples lifelong formation in personal, marital and family spirituality. The Franco’s initial reluctance to participate eventually turned around as they embraced the values it nurtures. They are now coordinators for Domestic Church for the Diocese of Baton Rouge and have been nominated to be a national spokescouple. The national couple will be announced the weekend of Dec. 8 during the national meeting that will be held in Baton Rouge. 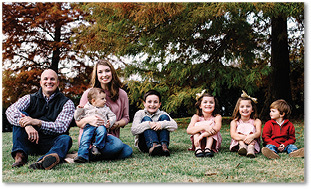 The Francos, who have been married 10 years and are members of Our Lady of Mercy Church in Baton Rouge, heard about Domestic Church from their close friends and current national spokescouple David and Kate Dawson, who brought the movement to the United States a few years ago. Initially, the Francos were not interested. But as pressures mounted on their marriage, Erin begged Michael to go on a men’s retreat. Returning from the retreat, Michael said he would go on a marriage retreat, but changed his mind as the afterglow of the event faded. Since then they have heralded the life-giving elements of Domestic Church. The movement focuses on catechesis, formation and accessing the treasures of the church’s teachings on marriage, family life, prayer, Scripture and the sacraments, according to the Francos. Couples begin by going on an evangelization retreat in order to experience the Gospel and saving power of Christ as a couple. Then the couples have the opportunity to join a circle of four other couples and a priest. The couples are of different ages and walks in life, whose insight the Francos find enriching. The circle meets once a month in the homes of its members to share the joys and sorrows of the journey, pray together and go over new formation material for the month. They also look at their progress in spiritual growth according to seven promises: daily individual prayer, daily study of Scripture, daily couple prayer, daily family prayer, monthly couple dialogue, the rule of life and yearly retreat. The circles are a “gentle accountability” and couples aren’t expected to be perfect. However, they are encouraged to “meet in the middle,” especially when it comes to faith. Sometimes when the Francos meet with their circle of couples, they realize they haven’t prayed together as much as they could have. But they receive encouragement and information that strengthens their resolve to continue their journey. And that includes setting priorities when it comes to their marriage, according to Michael. Sometimes it takes saying “no” to good things they could do separately in order to spend free nights talking and spending time together. “We take time to watch LSU ball games together or other extracurricular activities,” said Michael, who met Erin at Christ the King Church and Catholic Center at LSU. It can be difficult for the Francos to find time to pray together, and sometimes it may be a simple Our Father prayer at the end of the day. And there’s some vulnerability involved as they open up to each other. Their effort yields spiritual awards. “It’s about strengthening what you already have and keeping growing individually in your spiritual life. But it’s about a conjugal spiritual life – a spiritual life together. And that is such a game changer for a marriage when no matter how you are personally with God you go to God together regularly and intentionally. It’s huge,” said Erin. From the couple’s core strength of faith, it can evangelize and catechize the rest of their family. Their children include Gabriel, 9, Faith, 7, Gianna, 5, Roman, 2 and Aidan, 1. “It also gives you the tools to bring the faith to your children,” said Michael, a native of New Orleans and alumni of St. Pius X Elementary School and Brother Martin High School, both in New Orleans. Erin grew up at St. Jude Church in Baton Rouge and is an alumnae of St. Jude School and St. Joseph’s Academy. Surrounded by family, shortly before experiencing the wonderland odyssey of “The Nutrcracker” later that night, the Francos said Domestic Church has been a joyful journey. “We don’t have a perfect marriage, but I think we have a deep down peace we never had before,” Erin said. For more information, visit domesticchurchfamilies.com.